The Newcastle electric tramway system opened in 1902, and within two years the North Eastern Railway (NER) lost four million passengers - 40% of the 1901 total. The NER directors foresaw this loss and in 1902 decided to electrify the suburban lines on the north bank of the Tyne, east of Newcastle. 600V DC was supplied using the collector ("third") rail system. Partial opening between New Bridge Street and Benton, took place on 29th March 1904. This was only the second electric passenger service operated by a British main line railway company, with the Lancashire & Yorkshire starting its first Liverpool services one week earlier. The Tyneside system was fully operational on 25th July 1904, and quickly regained the lost traffic. Passenger ridership figures again topped 10 million in 1913. This required more rolling stock and a further thirty five vehicles were built by 1915. The electrified route was circular from Newcastle Central via Percy Main to Tynemouth, and back to Newcastle New Bridge Street via Whitley Bay, Monkseaton, Benton, and Jesmond. Services started at Central and terminated at New Bridge Street, or vice versa. A connection between the two Newcastle stations was built in January 1909, allowing New Bridge Street to be closed. Manors North station became the new terminus until 1st March 1917 when out-and-back running from Newcastle Central was put into effect. The original scheme also included electrification of the East Coast main line between Heaton Junction and Benton Quarry signal box. South east and south west curves joined Benton Quarry to the New Bridge Street to Monkseaton route. This allowed express services to operate via the south east curve to Monkseaton. The south west curve never carried an electric passenger service. All of the NER stock was built at York Carriage Works and was built with distinctive vertical match-boarding for the side and end panels. This was favoured by the NER from 1903 to 1908, but replacement electric vehicles were built like this until 1938 - thirty years after it had been dropped on other NER-designed rolling stock. All of the original cars were built with clerestory roofs. 'Cowhead' couplers were fitted, but buffers were only fitted to the parcels vans which were designed to haul other rolling stock. Electrical equipment was supplied by British Thomson-Houston Co., and fitted at York Works. GE Type 66 125hp motors with 3.34:1 gear ratios were initially fitted. The cars built after 1909 were fitted with Type 211 150hp motors fitted with 3.45:1 gear ratios. Collector shoes were initially fitted on the outer ends of the bogies. These were quickly moved to a central position, to lessen the effect of bogie pitching. The original 1904 clerestory stock consisted of 88 passenger carrying vehicles, and were described by a variety of different diagrams. 24 Diagram 90 motor cars were built with driving, luggage, and first class compartments. These were rebuilt in 1906-7 as first/third composites. 24 Diagram 91 motor cars were built with driving and third class compartments. 27 Diagram 92 trailers only had third class accommodation. All three diagrams had metal gates, and seating was in form of longitudinal and reversible transverse seats. Diagram 96 described a motor third with half-glazed doors, and driving cabs at both ends. Diagrams 90-2 were later modified to match. All later stock would be built with doors instead of gates. The two Diagram 97 was very similar but with a different seating arrangement. Five Diagram 98 were motor thirds with luggage compartments and two driving cabs. Five Diagram 99 cars were trailers fitted with two driving cabs. The 1904 stock also included two Diagram 100 motor parcels vans. These were built to handle parcels and fish traffic on the Tynemouth service. These were divided with a long parcels compartment and a short fish compartment. Driving cabs, buffers, and screw couplings were fitted to both ends. From 1908, these parcels vans were used to haul a worker train consisting of ten six wheel coaches. A parcel van was fitted to either end, and jumper cables allowed the entire train to be controlled from the leading van. A parcels van with a much larger fish compartment was built in 1908. The thirty five additional cars built by 1915, included a number of luggage composite cars, and eleven trailer thirds. These were the last clerestory cars built for the Tyneside electric system. On 11th August 1918, fire destroyed Heaton Car Sheds and thirty four cars. These were totally burned out, and others suffered heat and smoke damage. The next day's service was operated by a mixture of electric and steam trains. A completely electric service was resumed by 12th September. A replacement carriage shed was built at South Gosforth on 1st October 1923, and the old Heaton site was cleared and used as sidings for the electric stock. A three-road shed was built at Heaton for maintenance, but overhauls were performed at the nearby Walker Gate Carriage & Wagon Works. Between 1920-2, thirty four cars were built to replace those destroyed in the fire. These were built using the more powerful B.T.H. Type 254B 140hp motors with 3.54:1 gear ratios. The replacements were fitted with elliptical roofs, allowing them to be easily identified from the original clerestory stock. These replacements were given Diagrams 218-223 and with the exception of the roofs, they were very similar to the originals that they replaced. Even the original running numbers were retained. An additional Diagram 222 Motor Parcels Van was also built in 1921. At Grouping (1923), the Tyneside electric stock consisted of 91 clerestory roof stock and 35 elliptical roof stock. The LNER replaced the original NER crimson lake livery with a drab teak colour. Lettering and numbering used standard LNER gold. As a part of the LNER's carriage renumbering scheme, a '2' was prefixed to all of the running numbers in April 1925. A couple of accidents involving clerestory stock occurred in 1926 and 1933. These resulted in two motor cars being withdrawn from service. No replacements were built due to the impending withdrawal of these older cars. In August 1935, the LNER announced a similar scheme to electrify the line from Newcastle Central to South Shields. The original clerestory stock was in need of renewal at this time, so a system-wide assessment was performed. It was decided to move the 1920-2 elliptical-roof stock to the new South Tyneside electrification, and for the clerestory stock to be replaced by new Metropolitan-Cammell stock (see LNER Tyneside Electric Multiple Units). With the exception of the three Motor Parcels Vans, all of the original 1904-5 stock was withdrawn between August and December 1937. The Diagram 173 Motor Parcels Van (built in 1908) was transferred to Department duties in January 1939. The original two Diagram 100 Motor Parcels Vans were converted into De-Icing Vans. The surviving fifteen passenger cars that were built between 1909 and 1915 were used for workmen's trains for a couple of years. Between 1940 and 1945, they were stored as possible replacements in-case of air raid damage. They were never needed for this duty, and were cut up in 1945. During this period of extended storage, they were distributed amongst the sheds at Thirsk, Darlington, Scarborough, and Staveley. The de-icing vans used compressed air to feed de-icing solution on to the conductor rail. The van was locomotive-hauled with a brake van at a speed of less than 15mph. Each van could carry enough solution to treat all 90 miles of electrified track. They were eventually withdrawn in March 1966, but one survives in preservation. The new South Tyneside electric service required thirty six vehicles formed into eighteen two-car sets. Each set consisted of a motor car coupled to a trailer with driving gear. Only nine of the motor cars had luggage facilities. With only 35 elliptical-roof stock in existence, one luggage motor car was built at York to the same design. 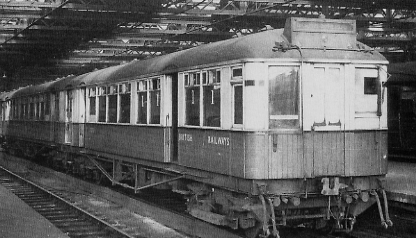 The stock was refurbished in 1937-8 and three motor cars were converted into trailers. The electrical equipment was updated, and the reversible seats were replaced by fixed seats. The new service began on 14th March 1938. The first South Tyneside withdrawal with Diagram 220 trailer No. 23249 which was withdrawn in May 1941 after suffering air raid damage at South Shields. Motor car No. 29191 was withdrawn in 1954 after derailing and hitting High Street signal box at Gateshead East. One trailer was converted into a Perambulator Van in 1951. This appears to have been a success, and three more trailers were similarly converted in 1955. These were only examples in Britain, and were intended to carry the prams of people who wished to spend a few hours at the North Tyneside resorts with their children. Hinged double doors replaced the central window, and simpler wooden seats were fitted along each side of the outer bays. The trailers were only used during summer weekends, when they were operated inside a train of the later 1937 LNER Tyneside stock. Two were withdrawn in May 1960, and the remaining two were withdrawn in July 1962. In 1955, British Railways replaced the elliptical-roof stock with new stock to a Southern Railway (SR) design. The remaining NER stock was withdrawn in 1955, and was last recorded operating the South Shields service on 17th May 1955. The only surviving piece of NER or LNER rolling stock from the NER Tyneside system is the de-icing van No. 900730 (ex-23267), which is owned by the National Collection. This is the last surviving example of clerestory roof electric rolling stock. A BR-era Tyneside 2-EPB set also survives. This was built in 1954 along Southern Railway lines. The complete set (car nos. 65321 & 77112) is owned by Suburban Electric Railway Association who are currently restoring them. Dave Alexander sells a 4mm scale (OO gauge) kit for the Tyneside Electric Parcel Van. Thank you to Bill Donald for supplying the above black and white picture of the original NER 1904 Tyneside stock at Heaton in April 1904, from the Bill Donald Collection. Thank you to Rob Langham for the colour postcard illustration of the original NER 1904 Tyneside stock.